Analysis shows that today the purchase of a UK house through a mortgage is affordable however at the same time UK house prices are not good value. This appears to be a surreal situation which is brought about by the abnormally low mortgage interest rates that are currently on offer today. It is now my belief that we won’t see fairly valued housing in the UK until mortgages rates return to some semblance of normality. With that in mind I’m starting a new dataset focused entirely on UK mortgage rates which will enable us to watch the mortgage market. This might give us a heads up on what might be about to happen to house prices. 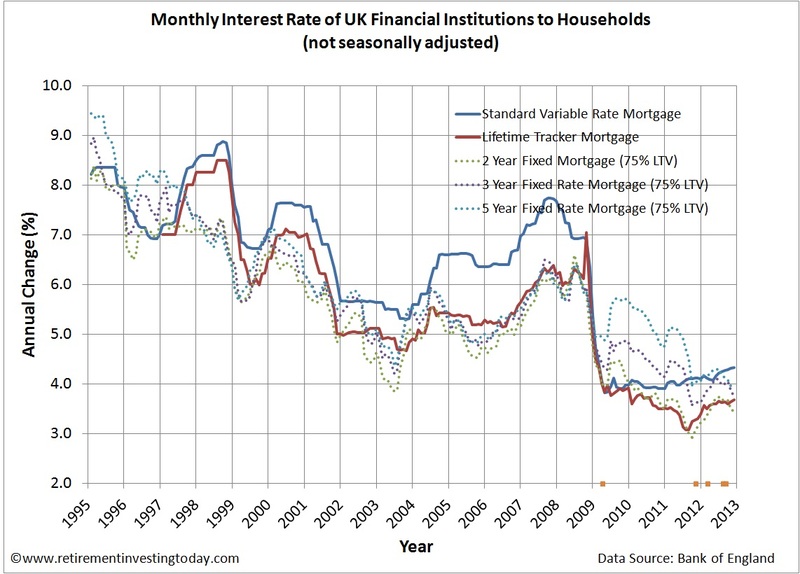 A history of these mortgage rates can be seen in the chart below. A zoomed version of this mortgage chart is shown below. I’ve also placed the announcement dates of some of the well known market manipulations that have been undertaken by the UK Government and Bank of England which have helped keep rates mortgage rates low. These include a Bank of England Bank Rate of 0.5%, 4 tranches of Quantitative Easing and the Funding for Lending Scheme (FLS). So what is happening to mortgage rates? Standard Variable and Lifetime Trackers are getting more expensive and are up 0.01% and 0.04% month on month respectively. Year on year they are up 0.22% and 0.38%. On the other hand the fixed rate products are getting cheaper. 2, 3 and 5 Year Fixed Rate Mortgages month on month they are down 0.05%, 0.14% and 0.04% respectively. I can only assume that this is brought about by the Funding for Lending Scheme. This Scheme looks to be a great deal for the Banks. From the 01 August 2012 until the 31 January 2014 they can borrow cheaply from the Bank of England for a 4 year period. The great bit for the banks is the security they have to offer are the mortgages themselves. So effectively the Bank of England carry all the risk if the mortgages go bad and the Banks make some nice profit on the mark up between what the Bank of England charges them and what they charge the Average Joe. If only I could get access to such a nice heads I win, tails I win scenario. It gets even better for the Banks as the more they lend the cheaper the fees they will have to pay. A pictogram of the Scheme courtesy of HM Treasury is shown below. It makes me wonder who the Government actually work for. To me this seems like a case of the Banks get guaranteed profit while the Average Joe on the street gets to buy an overvalued property which will be affordable for the next 4 years. My question is what happens after that 4 years or if interest rates rise? "My question is what happens after that 4 years ...?" You might be right however 4 years is a very long time in the current world we live. Governments are running massive fiscal deficits, QE to infinity seems just around the corner and we are now seeing true "globalisation" beginning to occur where the "West" is getting poorer (it hasn't even begun IMHO) while the poorer nations are getting richer. I don't know where will we end up however I wouldn't bank on FLS II. I'm simply staying with my current strategy and not forgeting to Save Hard, Invest Wisely and hopefully Retire Early. "It is now my belief that we won’t see fairly valued housing in the UK until mortgage rates return to some semblance of normality"
-When rates return to normality, it will most likely be because the wider economy has recovered sufficiently to allow for raising rates. -An economic recovery would most likely be accompanied by falling unemployment, increasing wages and improved consumer confidence. -A recovering economy, falling unemployment, increasing wages and and improved consumer confidence are NOT conditions normally conducive to falling house prices. Furthermore as it is likely that a sustainable economic recovery will not be achieved until credit conditions ease resulting in an increase in lending, and any such improvement in lending conditions will result in banks competing for market share again, it is also likely that an increase in base rates will not feed through to a corresponding increase in mortgage rates as competition erodes currently high bank margins. "The reason we would raise interest rates would be in the context of a much stronger economy with unemployment falling rather than rising. It should also be the case that the interest rates that borrowers face should not rise as fast as the rise in bank rate. "Along with the path of an increase in the bank rate -- which inevitably will come from where we are now back to more normal levels -- you would expect that to be accompanied by a process in which the spread between the bank rate and the rates banks charge would undoubtedly narrow." I don't think you'll see any meaningful falls in nominal house prices from here, instead, I think prices will continue to increase, even when base rates do eventually rise. As always it's nice to have a different opinion arguing a different case. - The Bank of England does not set mortgage rates, although I will agree the FLS is going some way towards it. If the market decides it's time to raise rates through for example a lack of confidence in sterling then rates could rise. So they could rise before a recovery. - Prior to all the reckless lending kicking off the ratio between house repayments and earnings, what I call the Affordability Ratio, was between 40 to 45%. That peaked at 74% in 2007 and is now back to 45%. 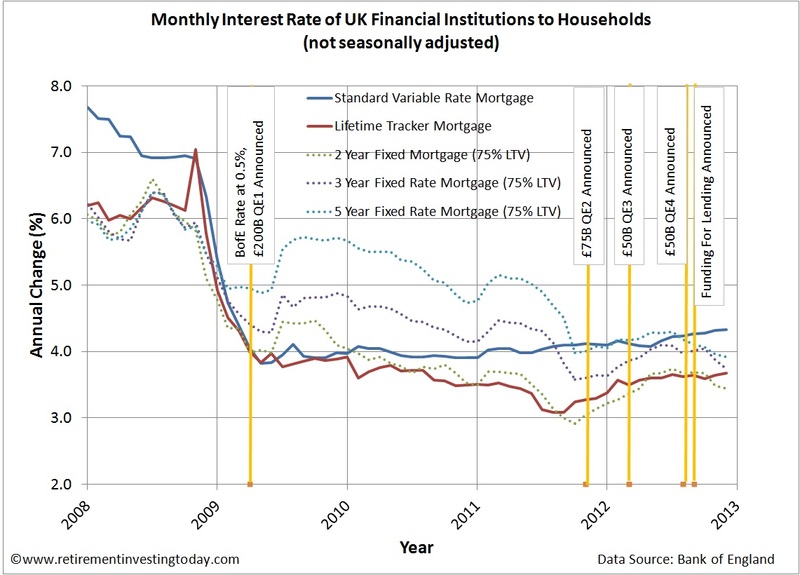 Unless we are going to get all that reckless lending again then I can't see the Affordability Ratio changing greatly. Therefore if we do get a recovery and interest rates rise then house prices would have to come down to mainatin the ratio. Please see my latest UK House Value vs UK House Affordability post for the detailed data. - Not so related to mortgage rates but certainly related to house prices. The FSA in December told us that there were 35,900 new reportable arrears cases in Q3 resulting in 303,200 total cases. (A reportable arrears case is where the borrower is behind on payments by 1.5% or more.) 4.6% of those cases have had their repayments suspended or reduced. In contrast only 8,521 cases were taken into possession in Q3 so clearly the banks are showing forbearance. My thought is at what point are the banks going to be recapitalised enough that they can start declaring some of these losses by possessing at a larger rate. More supply with no new demand could result in falls. Yet it also seems you eventually expect market rates to rise sufficiently that house prices will fall. However as market rates did not fall by anywhere near the level of base rates on the way down, it would seem a real leap of faith to assume they'd rise any more on the way up. A point that King has made several times... Current record high bank margins are likely to be squeezed when something resembling normal lending volume returns. Until then, FLS is starting to work, the volume of FTB lending increased by 12% last year, and average FTB house prices increased by 3% as a result. (source: Halifax) Which is of course a rise in real terms as well as nominal. So I suppose the real question is, what level of market rates would be required for house prices to fall, and how likely is it that we'll get them? I would argue the likelihood of market rates rising significantly in the foreseeable future is probably extremely low, and the likelihood of market rates rising to levels in excess of what they were at the peak of the last interest rate cycle is pretty much non existent. Because although the BOE does not set market rates, it can and does influence them when it wants to, FLS being a prime example. So the idea that the BOE would sit back and allow market rates to soar prematurely, without intervening (a la FLS or some other scheme) seems unlikely. Increasing rates will not automatically cause price falls.... Only prematurely increasing rates will do that. And given how much more there is at stake than just house prices, I can't see TPTB sitting back on their hands and allowing market rates to soar prematurely. There are simply too many policy levers the BOE can pull to prevent it happening. As for repossessions, the banks are showing forbearance because they've learned the lessons of the debacle in the 90's, and it's in their financial interests to do so. Their improving financial health is unlikely to change the fact that most borrowers in arrears will recover eventually, with a bit of tolerance, and it's cheaper/better-PR for a bank to work with them than repo. Arrears rates have been falling for quite some time as well, so again, it would seem a leap of faith to assume that repossessions will increase against a backdrop of falling arrears. Anyway, interesting little debate we've got going on here. It'll be fascinating to watch things unfold over the next few years. Thanks for the detailed reply. It's certainly going to be interesting watching how this all pans out. I look forward to our further debates as this all unfolds.